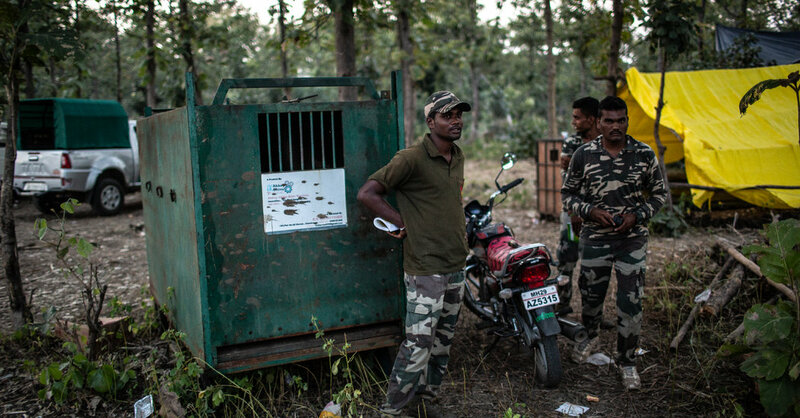 They check more than 100 camera traps. They search for tiger hairs and study the stony, undulating terrain for tiger tracks, known as pugmarks. In the past few months, T-1 has been spotted only a few times, for just a few seconds. The rangers have sacrificed several horses to draw her out. She’s ripped into them, eaten fast, then vanished. Earlier this year, the rangers managed to dart her once but the dart didn’t stick and she slipped away. Tranquilizer darts are notoriously difficult to use. About 10 inches long with a feather on the back, they look like a flying syringe. They must be fired at close range, usually no more than 80 feet away. He said it was highly unusual for a tiger to turn into a man-eater. But there is little traditional prey, like deer, left around Pandharkawada. Once a tiger encounters a person and kills, it may develop a taste for human flesh, which, Mr. Khan says, is sweeter than other animal meat because of all the ginger, salt and spices people consume.